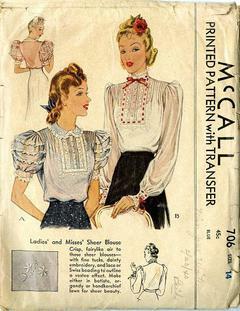 1939 McCall #706 vintage sewing pattern, misses' sheer blouse with original transfer, size 14. Crisp, fairylike air to these sheer blouses - with fine tucks, dainty embroidery, and lace or Swiss beading to outline a vestee effect. Make either in batiste, organdy or handkerchief lawn for sheer beauty.